produced in the 1950s and ’60s. In Sister Santee, he spun and all-too-believable yarn about the pine plantations and racial uneasiness in the 1970s and ’80s. 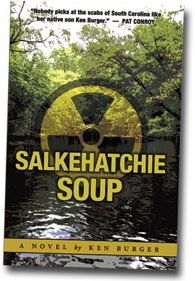 With Salkehatchie Soup, Burger returns to his birthplace to expose the remains of 50 years of nuclear waste buried in our beautiful state.